Character Parallelogram program written in Python was developed to show the Working of for loop in Python along with string slicing. The program was written using Python 3.6 and Visual Code editor for Windows. Character Parallelogram Python Program takes a string from Input and print the characters available in this string in the format of a parallelogram. Here is the python code for character Parallelogram. 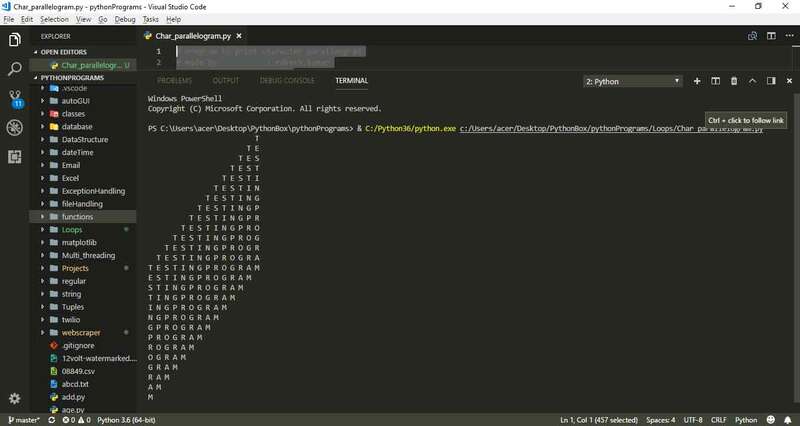 The above program takes a string from user using standard Python function INPUT() that actually receive everything as a string so there is no need to convert this into string. 4tht Line find out the total no of chars in this string, Next line is responsible for running a loop through 1 to n as the range command always runs one step less defined in range() function this +1 is added here. 5th Line run again a for loop that is responsible to print spaces before printing actual sliced string. Here we have added end=” ” so that print() function do not add a new line automatically. 6th line takes your string ans slice it from the beginning to the point of loop. 7th line print is here only to generate a new blank line. 7th, 8th and 9th line are, I think, self explanatory. Though, We have taken care to prepare this Character parallelogram program as per the Python coding standard. Still, if you find any better way to code this program, do not hesitate to contact us. We will print your code with full credentials.